Taking the time to roll up your sleeves and get the task at hand done yourself is an admirable decision that can provide a number of benefits. From changing the oil in the car to painting the bedroom, homeowners across Georgia have a wide range of tasks that can improve the value of their home while enhancing the overall livability of their sanctuary. These projects can vary widely in price, however. Replacing the cabinets in your kitchen, for example, can be very costly and time consuming. Detail Design & Remodeling is proud to be your team of local home remodeling contractors, specializing in cabinet refacing for Atlanta homes to deliver amazing results. Cabinet refinishing can refresh the face the doors and exterior surfaces of your cabinets, leaving the boxes in place in order to save time, waste, and resources. For years, we’ve specialized in creating amazing solutions with custom cabinets and renovations, creating customized plans that are tailored to the budget and needs of each client. We built our company on hard work and a do-it-yourself approach, so we understand the value and pride of taking the project into your own hands and creating a stellar outcome. When it comes to cabinet resurfacing and refacing, however, certain details need to be considered before going to your local hardware store. Today, we’ll discuss a few aspects of kitchen cabinet refacing that are important to think about before beginning your DIY job. When you’re done reviewing them, be sure to contact our experts to receive a quote for your upcoming renovation project! Once you have decided that cabinet refacing is a smart move for your Georgia kitchen, it’s time to look at whether or not you or a professional company should do the work. It’s important to note that home remodeling contractors are licensed, bonded, and insured to keep your home and everyone in it protected at all times in case something goes awry. Beyond the peace of mind of working with the pros, homeowners often consider the budgetary constraints. 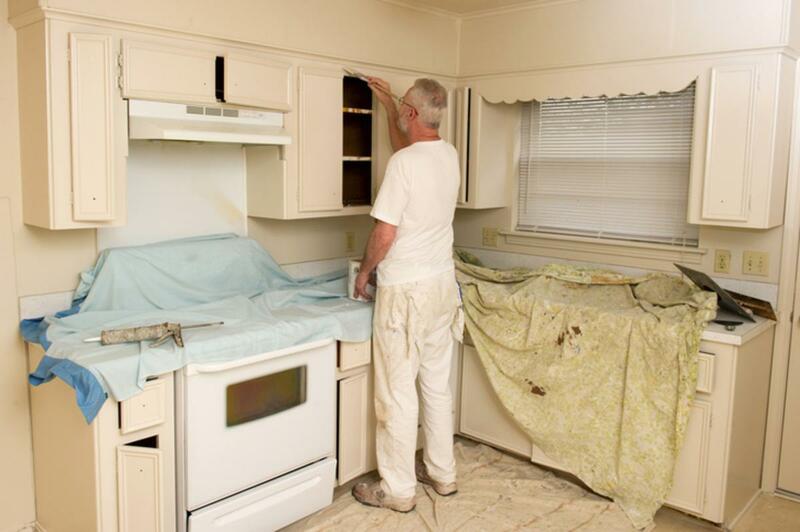 At the most basic level, cabinet refinishing will be more affordable to do it yourself. However, when you look at the considerations below, you should realize that the culmination of risks and rewards often make hiring our home remodeling contractors a very cost-effective choice! Homeowners who want to complete the task themselves will first need to decide on the details of their kitchen improvements. The veneer or finish for your cabinets, for example, should be acquired before commencing. Beyond the material needs for cabinet improvements is the panoply of construction tools required to produce a quality outcome. Refacing your cabinets with veneer, for example, will require a drill, glue, spray, tack cloth, sandpaper, tape measure, moulding nails, and more. The full assortment of tools varies from kitchen to kitchen, and many homeowners find themselves having to go out and purchase specific items that are missing from the inventory. Homeowners who do not collect tools for this type of work may end up spending a lot of money acquiring the equipment needed before they can even begin the project. With the cumulative price of new tools, you may end up saving money and extra trips to the hardware store when working with Detail Design & Remodeling instead! Having sufficient knowledge and experience can help minimize costly setbacks and frustrating mistakes. Our home renovation experts draw on years of experience in the industry to create beautiful, durable results for our clients, yet we are always challenged by new and complex challenges. Inexperienced homeowners, on the other hand, may struggle with the logistical comprehensiveness of a job that appears simple on the surface (no pun intended). Calculating the project costs, for example, can make or break your project. From the cost of new hardware and accessories to the leeway expected for measurement errors, it pays to have a professional knowledge in this technical industry. Placing your kitchen under construction may impact your daily life in a major way. Without a space for cooking and preparing food, many families struggle to feed everyone in a healthy, economical fashion. DIYers will be responsible for working long hours (after their day jobs!) in order to complete the project in a fast manner. Otherwise, your routine can face road bumps for weeks to come! Our home remodeling contractors have worked to refine our cabinet refinishing process, delivering quality results in a very expedient manner. You can cut the wait time in half and avoid long nights and tired mornings! 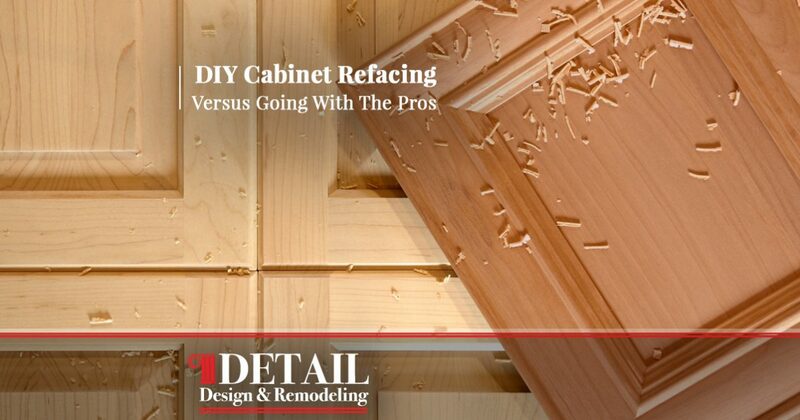 One risk of doing a home renovation yourself is that you’ll be responsible for the repair of any mistakes made in the cabinet refacing process. Minor cosmetic imperfections, veneers that aren’t flush, and everything in between can disrupt the finished view of your new cabinet combination. Many homeowners underestimate the logistical and technical challenges involved with updated and custom cabinets. Any minor flaws can create dramatic visual differences when placed on a newly updated surface. As always, our home renovation pros are here and ready to provide expedient and precise corrections for any of our work that you are not happy with. When it comes to doing the hard work yourself, we understand the pride and cost benefits of doing the job with your own hands. When it comes to precision projects such as cabinet refinishing, however, the best outcome often comes with professional assistance. Detail Design & Remodeling is proud to be Atlanta’s cabinet refacing experts, providing amazing outcomes each and every time to exceed our customers’ high expectations. Contact us today to learn more or to receive a quote for your kitchen!